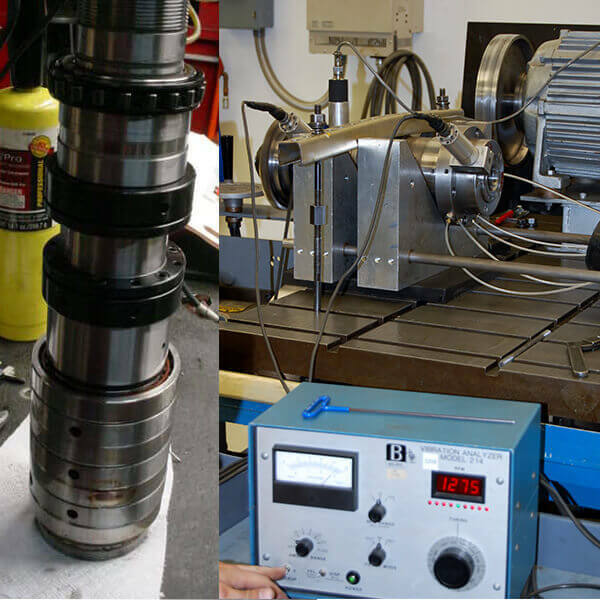 Your Kitamura spindle is in expert hands with the factory-trained, Big Plus–certified technicians at High Speed Technologies, Inc. We have repaired dozens of Kitamura spindles to original factory performance. Need it fast? We can repair your spindle within three days of customer approval, and we offer reduced pricing for longer lead times. All spindle repairs are backed by a complete warranty and our 30-year reputation of OEM-quality spindle repair. At HST, we replace all bearings with top name-brand ABEC 7 super-precision spindle bearings. Your spindle repair will include replacing or restoring all worn drawbar springs, seals and critical surfaces. Then we perform high-speed balancing to eliminate vibration, extend life and improve part quality. HST has provided the CNC machining community with a high-quality alternative to higher-priced OEM spindle repairs since 1986. We like most of the Kitamura spindles because they are a straight forward and robust design. They go together well and we always get good performance from our repairs. Below are other examples of HST’s OEM-quality repairs on Kitamura spindles. 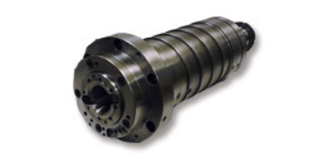 For expert Kitamura spindle repair, call us at 1-603-483-0333 for a quote. We are fast, experienced, and our work is guaranteed. This 10,000 RPM spindle from a Kitamura Mycenter vertical mill had definitely seen better days. The bearings were contaminated and the ID taper was pretty dinged up. We receive these spindles from a large 2nd tier automotive supplier who makes power steering assemblies. They are very competent at totally rebuilding their CNC machines. They will strip down a machine to the bare castings and rebuild every single part to like new condition. But when it comes to repairing the spindle, they send it out to the experts at HST. They know that proper spindle repair requires special equipment and skill sets. For maximum life, spacers need to be ground to micron tolerances and shoulders need to be perfectly flat and perpendicular to the axis of rotation. They take Dirty Harry’s advice (youtube clip). It’s good advice for all of us. But this is especially so when it comes to super precision repair of production critical equipment. So unless “you’re feeling lucky” when you have a Kitamura that needs repair, give us a call. The ID taper is pretty beat up. At HST we can restore damaged tapers to like new condition. On the right is the same spindle after our GPG process. After our comprehensive rebuild the spindle preformed like new. Run out at 300 mm was 5 µm. Because of their design Kitamura spindles are very difficult to balance. None the less our numbers were very respectable; well within passing. Acceleration numbers were 0.0739g and velocity numbers were 0.0313 in/s. We received the spindle off of a Kitamura Mycenter HX300 series machine. The customer went out of their way to secure the components is a solid crate. Unfortunately many customers do not take the time to properly protect and secure the equipment and we often receive spindles that the damage caused by shipping is more severe than the damage from the original problem. In some cases immigration has caused even greater damage. We received this Kitamura Mycenter HX300 carefully crated. The rear roller bearing failed due to contamination. The Kitamura design uses robust bearings with good separation. This provides a rigid response. However certain designs such as this HX300 use internal lock nut to hold bearing preload. This makes balancing them extremely difficult and time consuming. The quad bearing set up fronts provide robust support. But the two locknuts in the center make high speed balancing very difficult. Repairing Spindles for over 30 years!